And communications between the City Center and any member of the City Council. I have been through this issue before as regards FOIL. As I understand it, when it comes to correspondence in general between public institutions, items of fact are accessible through the FOIL process but opinions, etc. are not. This has something to do with allowing officials to correspond candidly without having to worry about how their words might be interpreted or used. Mr. Tingley also argued that the City Center was acting as a private developer and that for some reason this would exempt them from the protection that the city exercised. Attorney Izzo then argues that the City Center cannot be considered a private developer and denies the request on that basis as well. As many readers will remember, the city removed the downtown district from the restriction that solar panels cannot be shadowed by neighboring buildings or trees. The issue was precipitated by the Mouzon House which installed passive solar panels to heat water. Based on the existing ordinance, this meant that the City Center would not be able to build its garage. In light of the fact that the Pedinottis seemed to be in a sufficient rush that they did not secure a building permit or DRC approval as required before installing the units and that they chose to use non-photovoltaic units which were considerably cheaper, many people, myself among them, suspected that the purpose of the units had more to do with their conflict with the City Center than with saving energy. Given the passions surrounding the City Center Garage there developed two narratives regarding the solar ordnance change. The first was that the zoning law change occurred as part of a conspiracy between the City and the City Center to nullify the law protecting the Pedinotti’s solar panels so that the City Center could build its garage. The second, and one I share, was that the Pedinotti’s actions exposed a fundamental problem with the zoning law as regards the downtown. The City’s Comprehensive Plan calls for intense development downtown. Such development necessarily entails building “up” since building out would compromise the City’s desire to maintain a greenbelt. It was noted that the very popular Northshire Book Store building could not have been constructed had either of their neighbors placed solar panels on their roofs prior to its construction. One assumes that in his FOIL, Mr. Tingley was seeking evidence to bolster the conspiracy theory. 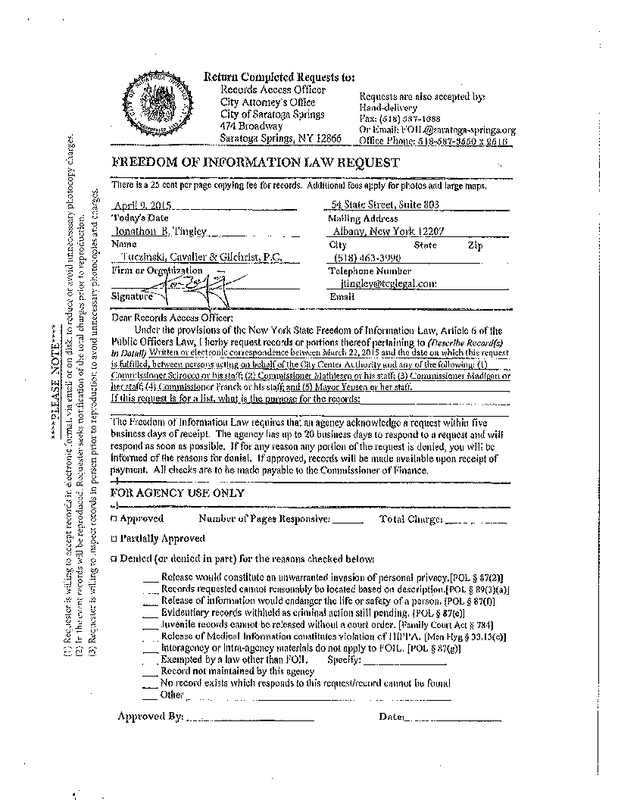 The first documents are the response to the original FOIL request before the appeal. There is a cover letter from City Attorney Vincent DeLeonardis. What follows are the minutes of several City Center meetings and a letter to the editor written by Michele Madigan. The next set of documents begins with a letter from City Attorney Izzo responding to the appeal by Tingley by agreeing to provide additional documents. As noted above, these additional documents are extensively redacted. The emails can be very confusing. Instead of blacking out text, they have whited it out. This creates extensive areas of white in the document so it is often hard to know what you are looking at. There is also the problem of many duplications of the same email. As most people know, when you respond to an email, the text from the original sender is included with your response. Due to the lack of formatting, it is impossible to tell when any individual piece of email ends. This results in repeated reproductions of emails. I did not have the patience to go through the document to determine exactly how many emails are involved. The result is that glancing through the document makes it appear that there were many, many, many redacted emails when in fact, most of them are simply duplicates. Mark Baker, the executive director of the City Center, worked hard to organize support for the zoning change. Sonny Bonaccio was out of town but offered to do what he could to support the change. Mark Baker sought clarification about the time line for the process. Mark Baker thanked Chris Mathiesen for his vote supporting the change. Mark Baker thanked Skip Scirocco for his vote supporting the change. Mark Baker informed Michele Madigan that Todd Shimkus and someone from Bonaccio construction would be speaking in support of the zoning change. Sonny Bonaccion opines that of all the members of the City Council, Michele Madigan is the only one he likes (the only amusing item in all the documents). First it is important to understand who redacted the documents and what the process was like. The FOIL requests all go to the City Attorney. It is his responsibility to review the documents to see whether it is appropriate to release them (redacted or not). It is my understanding that he does not consult the individuals associated with the document(s). It is also reasonable to expect that given the litigious history of the Pedinottis that the City Attorney would be extremely cautious as to what was released. The attorney sees his role as doing everything possible to minimize the risk to the City. I personally believe that the council acted to change the zoning law not just because the policy was problematic for the City Center but because it was problematic for the downtown. I do not see the two as mutually exclusive. I would expect that if the full text of all the redacted documents were released they would simply document that the City Center wanted the changes which is hardly revelatory and that members of the Council agreed that the change would benefit both the City Center and the entire downtown. Yes, I am conjecturing. Just because something is legal does not mean that it should be done. I believe that it is bad public policy to be so conservative in barring the public from information about the exchanges between our city and other institutions except in the cases of such things as litigation, personnel matters, and negotiations. The excessive redacting of documents leads to the understandable suspicion that what is being hidden is somehow wrong and should be exposed. Documents should only be redacted on the same basis that some meetings can be done in executive session. Only if the subject involves litigation, personnel, or negotiations should they be hidden. The more the public can know about the actions of their government, the stronger our democratic institutions will be. 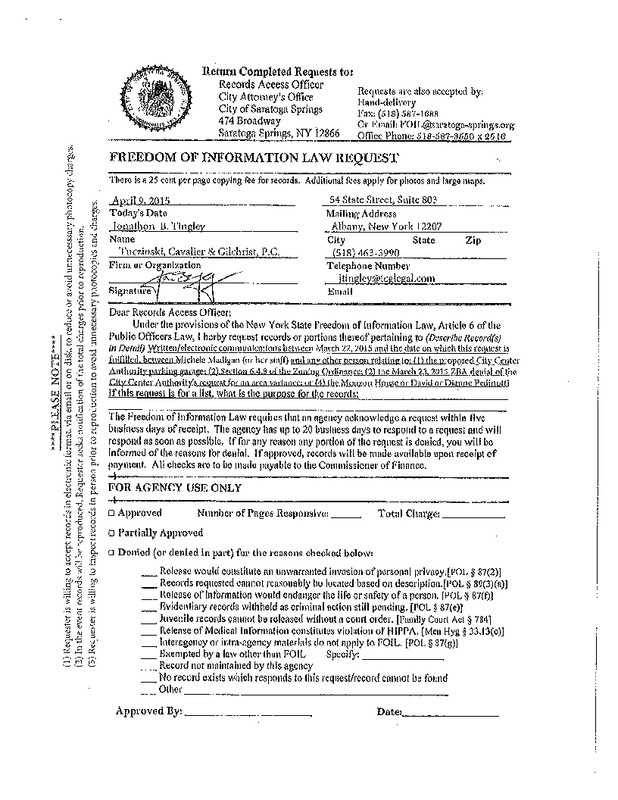 If I were king, I would require that before a City Attorney denied a FOIL request or redacted it, that the attorney would consult the author of the document to find out whether they want to exercise their right to withhold the information. Having said that, I concede that it is by no means a simple issue. I have seen the damage a poorly crafted document can have in the hands of a skilled attorney. This is the kind of thing that people of goodwill can disagree about. timing is everything in this case….if this isn’t collusion,there ain’t a steer in Texas. John Brown. In order to post comments on this site I must have a valid email address. As you know, I have not posted several of your comments. I tried to email you to explain why I could not post them and both came back because of an invalid email address. If you do not provide me with a valid email address, this is the last time I will be putting up your comment. John Kaufmann – I would like to suggest that you have a rule that people MUST post under their real name. Too many people hide behind a moniker and spew for lies without any documentation otherwise and should eb held accountable for their actions. Anyone who has read the comments of our local ‘news’paper understands all of the problems it cause. Let me set the record: there is absolutely no conspiracy about the Pedinotti’s installing the solar to blockade the building. They were approached by the installation company (not the other way around) and pitched the solar because large grants from NYSERDA covered the majority of the cost and made it an extremely low investment to return ratio compared to the high cost and 7-10 year ROI from Photovoltaic panels. Same reason Pennells, Downtowner, Cudneys Cleaners, and even Skidmore all invested in similar solar thermal systems, and mainly because a local resident works for the installation company. Previously the city did not require a building permit for solar thermal, and since David Pedinotti had already obtained the DRC approval for the new standing seam metal roof, it was mistakenly thought that the solar was included in that approval. The installation was not rushed in the slightest, but in fact was delayed almost a year after being sold due requiring the new roof be first installed. The system was pitched and sold before the Pedinotti’s were even aware of the existence of the solar ordnance. While I agree it may seem that the Pedinotti’s engineered some grand solar conspiracy, it was actually more of a happy coincidence that worked in their favor. Their lawyer only uncovered the solar ordnance information after the system was installed, and then understandably used it as an angle to try to change the parking garage plans. I would like to know why people think there is this vast conspiracy between council members and the city center! This project has been going on for over THREE YEARS now. They were also willing to see other proposals, and in my talks with said council members they had no issues looking at other proposals either. The ONLY reason they are continuing forward on the original proposal is because if the new proposals don’t pass ‘snuff’, they don’t want to lose time on the project, because the City Center is in serious need of parking. That impacts the city center, the tax base, and obviously the tax payers of the city. It would be foolish NOT to continue forward with it. One thing is for sure: whether the result of deliberate design or a fortuitous coincidence, the saga of the Pedinotti panels certainly illustrates why the solar ordinance needed to be change for the central core of the city and really citywide. If the Pedinottis are successful in getting the solar ordinance change overturned very little can be built on that city lot–certainly not either of the gigantic mixed use developments the Pedinottis have pushed for–unless of course they take down their panels to accommodate a particular developer. This makes them the sole arbiters of what can be done on a city owned lot. That’s a lot of power in the hands of one family particularly over the fate of what they continually point out is publicly owned land. This kind of land use conflict can play out all over town with the way the city’s solar ordinance is written. A homeowner who doesn’t want his/her neighbor to build an otherwise permitted addition has only to put up a solar panel to block what the neighbor might otherwise be able to lawfully do with their property. Under the existing ordinance a homeowner may have to cut down trees on their property if they grow tall enough to shade a neighbor’s solar panel. It’s time to move beyond the old technology of individual panels on individual structures with all the unintended consequences they can bring. We need instead to move towards a more comprehensive and less conflict ridden strategy of community solar.